Bradley's has such a beautiful and rich story! In 1995, after working for a chocolate company in Florida during his high school and college years, Brad (owner) was visiting his dad in Knoxville when the dream began. 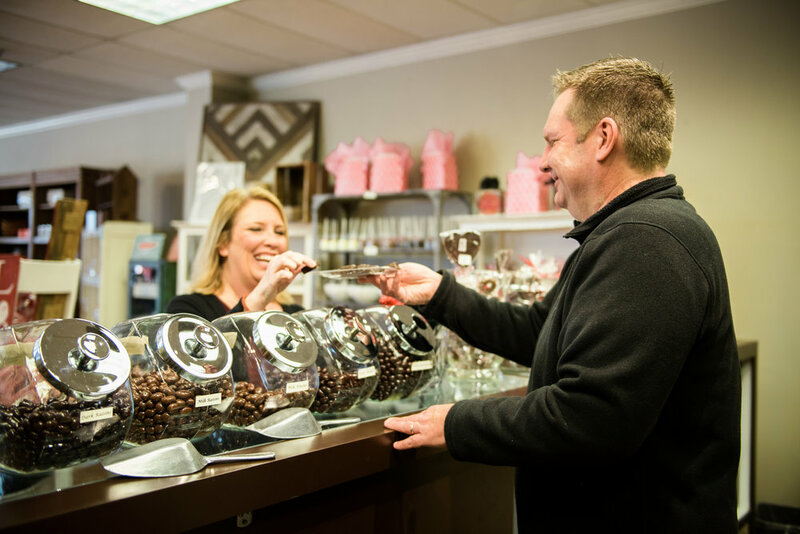 The two opened the doors to Bradley's Chocolate in a small, tucked-away space where few would find them but those who did fell in love with the sweet treats instantly! In 2000, they relocated to a bigger location on North Peters Road which happened to be next door to a shop where Joy worked; practicing her love for customer care and visual merchandising. It wasn't long before Joy wandered over to Bradley's for a taste of chocolate and as Brad always tells her, she only payed for something one time. The two spent hours talking over the candy counter every week, getting to know one another. Before machines and equipment were purchased, Joy would watch Brad hand temper chocolate and dip caramels, turtles, and all kinds of sweet treats for the shop. "His heart was like a marshmallow and he made chocolate for a living! How could I not fall in love with this guy?" In 2002, Brad and Joy married and went right to work on creating a space that reflected both of them. Joy added a sense of "home" to Bradley's. Locally made gifts, cards, candles, and cozy home decor started nestling their way into the shop and paired perfectly with Brad's array of delicious handmade treats! 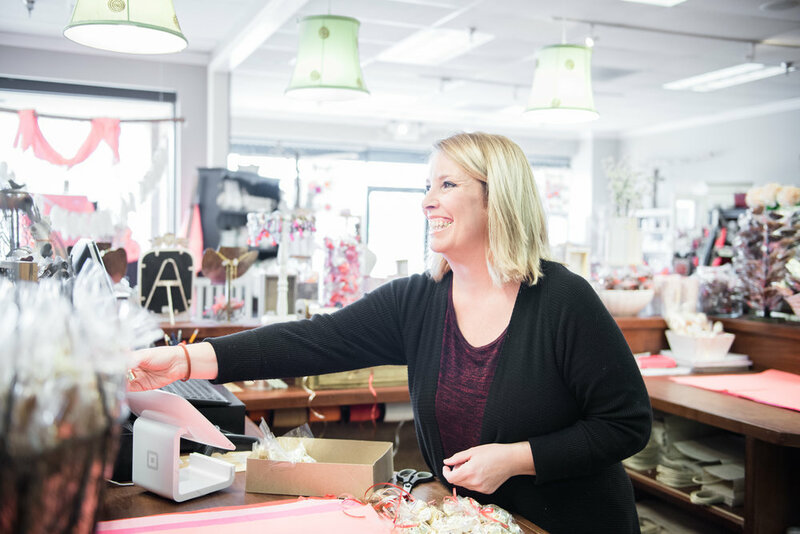 The two of them spent time getting to know their customers who quickly became friends and Bradley's was becoming Knoxville's Sweetest Place; a place of community, friendships, and belonging. In 2012, Brad and Joy moved Bradley's across the street and more than doubled its size. 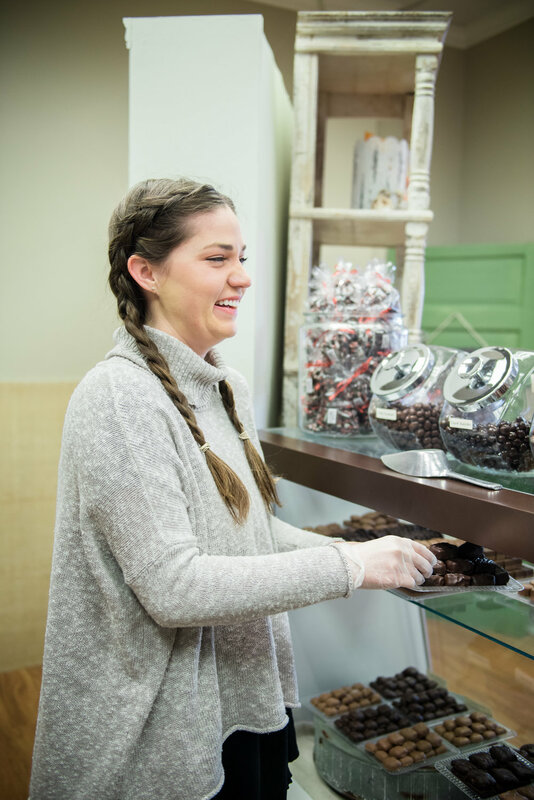 They also purchased a local candy factory now known as Knoxville Chocolate Company where Brad makes the shops' over 100 chocolate treats including the famous Tennessee Walking Stick: a pretzel rod dipped in caramel, rolled in pecans, and covered in rich chocolate! 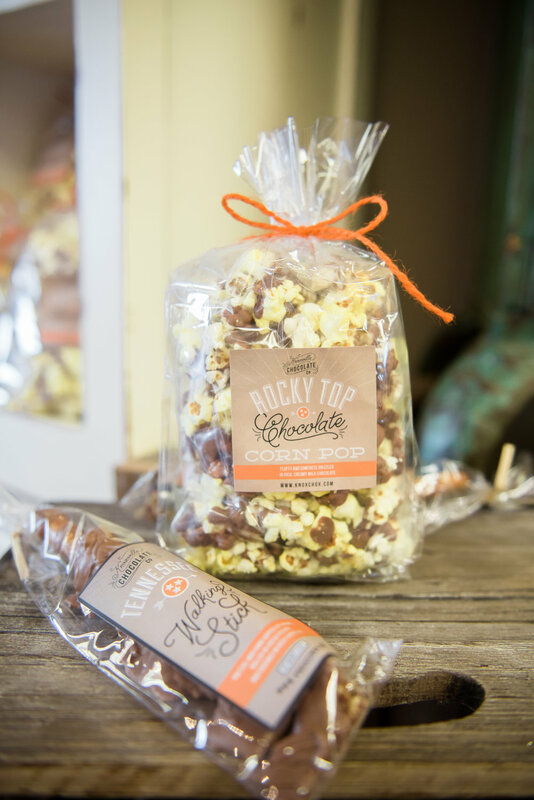 One of their other most popular treats is their Rocky Top Chocolate Corn Pop; perfectly popped, buttery, salty popcorn drenched in creamy milk chocolate! Having been in business over 20 years Bradley's has become a family tradition for many holidays! Children have had this sweet chocolate tucked in their Christmas stockings and Easter baskets and as they've grown up, they have had the privilege of making chocolate for their graduations, weddings, and baby showers! Now, with 3 children of their own, "Making Chocolate Covered Memories" is more than just a sweet tag line, it's a way of life. Brad and Joy want their kids to know what it means to work hard, build relationships, persevere through hardships and how to give and receive grace! Having their own business certainly teaches them all those things and they get to eat amazing chocolate along the way! Brad and Joy are so thankful for this "sweet life" that they get to share with each other and they are so glad that you are part of it! Bradley's LOVES being a part of special events! If you are planning a wedding, baby shower, graduation, birthday party or other celebration, come in and let's see how they can make that day sweeter! 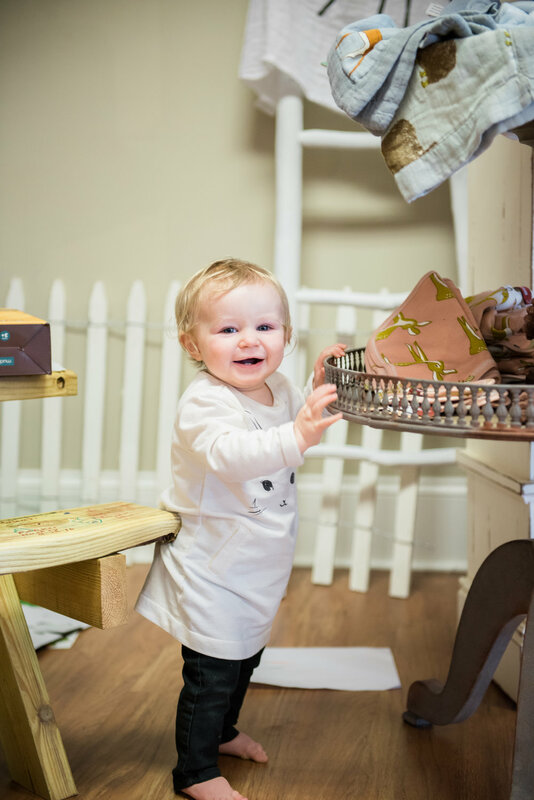 Bradley's also helps you create a cozy space of your own with soft pillows & blankets, candles, beautiful artwork & signs along with tabletop decor, bowls, plates, and of course all of our chocolate treats to fill them with! They believe decorating should be simple and fun! Always surround yourself with things that make you smile! Brad and Joy are the owners of Bradley's. They believe in a God who orchestrates and orders life in extraordinary ways! They believe He has created us with the gifts and talents we have in order to serve others. Brad has a heart for people and a passion for creating delicious treats that delight all those who taste them! Joy loves bringing beauty and warmth to a space and her heart longs for others to feel cared for and loved when they step into that space. Together, they want Bradley's to be a gathering place. A home of sorts; where sights and smells are familiar and comforting. A place where you can get a piece chocolate and sit on our couch for a while! Take a load off. Enjoy a conversation with a friend. Make a chocolate covered memory. 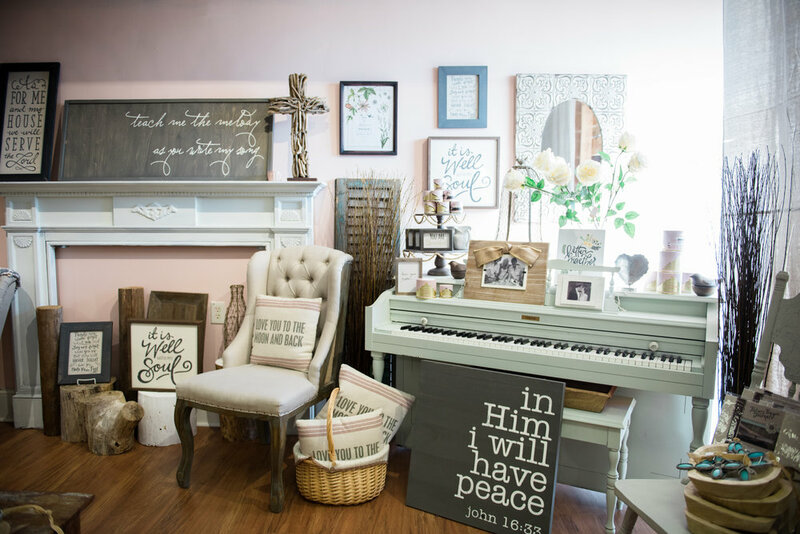 Because they believe that long after the "things" that they sell are gone, you might remember the feeling of love and joy and peace that they pray their shop provides. Thank you for being part of their story!